When it comes to knowing God, having a relationship with Him, we must have a proper explanation of who God is, what He is like, and how He must be approached. God is transcendent and so it follows logically that if man is going to know the truth about Him with any certainty, God must condescend and reveal Himself to man. There has been no greater revelation of God than when His Son, the eternal second person of the Godhead, became flesh and dwelt among men. Jesus Christ revealed the Father. He explained Him (John 1:18). Through Jesus we have the proper explanation of who God is, what he is like, and how He must be approached. John 1:14 presents Jesus as the tabernacle, the place where holy God and sinful man could meet in intimate relationship based solely on the initiative and grace of God. The Old Testament tabernacle was the foreshadowing of the coming of the Son of God as a man in order to reveal the Father, redeem sinners, and rule in righteousness. The tabernacle housed the glory of God because it housed the presence of God. We read that after Moses erected the tabernacle that the glory of God filled it and Moses couldn’t enter it because of the heaviness of the presence of God – “Then the cloud covered the tent of meeting and the glory of the Lord filled the tabernacle. Moses was not able to enter the tent of meeting because the cloud settled on it, and the glory of the Lord filled the tabernacle” (Exodus 40:34-35). The same thing happened again when the ark of the covenant was brought into the Temple built by Solomon – “It happened that when the priests came from the holy place [they had set the ark of the covenant in the holy of holies in the Temple (verses 4-8)], the cloud filled the house of the Lord, so that the priests could not stand to minister because of the cloud, for the glory of the Lord filled the house of the Lord” (1 Kings 8:10-11). This glory of God was referred to as the shekinah glory. So what can we learn from the tabernacle that would be fulfilled in Jesus? First, the eternal God would become a man – “And the Word became flesh.” Here we see the biblical teaching of the incarnation – a doctrine that is absolutely crucial to our redemption – God became a man in order to live a sinless life and then die a substitutionary death to fulfill His own holy demands so that He could justly save us from His wrath and enable our relationship with Him. God’s wrath against us is removed through our faith in the work of Christ for us and our love for God is generated through our faith in the work of Christ for us. In order to accomplish the work of redemption for us, Christ had to become a man. Second, we learn from the tabernacle that God would dwell among men – “And the Word became flesh, and dwelt among us.” The word “dwelt” means “tabernacled or tented.” God became a man and tabernacled among us. He pitched His tent among humanity. 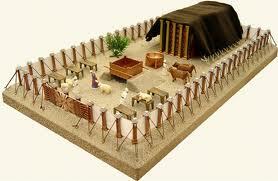 The Old Testament tabernacle was where God’s presence was among His people. The tabernacle offered access to God on God’s terms. The tabernacle was the place of sacrifice, the place of cleansing, the place of light, the place of life, the place of intercession, and the place of mercy. Glory is from the word “doxan” from which we get the word “doxology.” To see someone’s glory is to see his worth, his honor, his majesty, etc. Those who receive Jesus do so because they see His worth, they see His glory! For instance, after water got sunburned by the glory of Jesus and turned into wine at the wedding in Cana, we read, “This beginning of His signs Jesus did in Cana of Galilee, and manifested His glory, and His disciples believed in Him” (John 2:11). The glory of Jesus was not a reflected glory but a radiating glory (Hebrews 1:3). We are created to reflect God’s glory, but Jesus radiates God’s glory – “glory as of the only begotten from the Father.” “Only begotten” means unique, only one of His kind. It does not mean that Christ was created (see Hebrews 1:5). He is God’s only Son. “From the Father” shows that God sent His Son, His only Son whom He loves, to redeem sinners. There is no greater demonstration of love than God sending His only Son whom He loves to live a sinless life and die a sacrificial death to redeem us and restore us. Fourth, we learn from the tabernacle that God is full of grace and truth – “And the word became flesh, and dwelt among us, and we saw His glory, glory as of the only begotten from the Father, full of grace and truth.” Grace is undeserved kindness. While the tabernacle proclaimed that God was full of underserved kindness, Jesus Christ demonstrated it. Truth is absolute rightness. We can say that truth is strict righteousness. Truth is unyielding faithfulness. The tabernacle proclaimed that God was full of truth by proclaiming that access to God had to be on a basis that upheld the righteousness of God and His Law. Jesus Christ demonstrated it. The kindness of God never nullifies the righteousness of God. Grace and truth are to never be pitted against one another as though one is more important than the other. When God forgives it is only on the basis of the Law upholding work of Christ. Do you see in Jesus that God is full of grace and truth? Do you see the worth of God in the face of Christ?